We are already deep into Day 2 of YCS Prague. And the longer the event lasted the more spicy tech cards showed up. This article is an addition to part 1 of our Tech Update released yesterday. Check it out! Forbidden Apocrypha is not a new card. It was already released in Breakers of Shadow but kind of stayed under the radar until recently. The card is a very strong tech card against Zoodiacs and any other XYZ strategy. It’s basically another field wipe against Zoo. The only downside of the card is that it’s rather easy to play around it. At least it forces the opponent to do suboptimal plays. 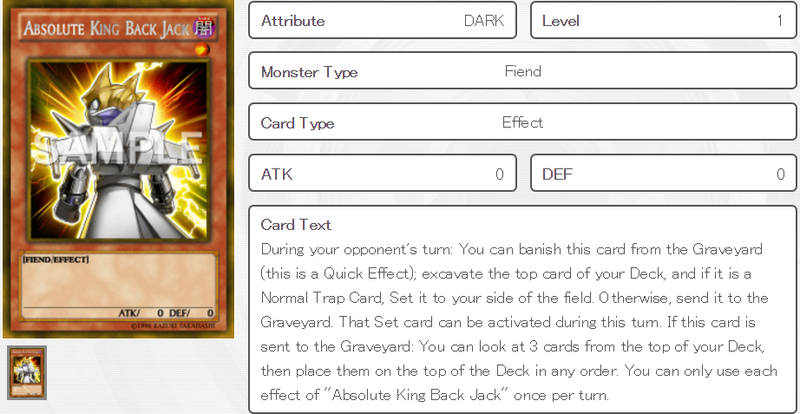 Absolute King Back Jack also seems like a blast from the past. The card has seen some play in the Burning Abyss format to dig for traps and set up the next turn. Nowadays it combos well with Fiend Griefing and all the paleozoic trap cards as well as Dimensional Barrier. Will this card prove to be crucial in the current metagame? Fiend Comedian is another one of these old cards! The card was very much overlooked. Then it saw play during the Lightsworn format. In the current metagame it is a strong Side Board pick against any Graveyard related Decks. Alpay Engin showed us the perfect situation to use the card efficiently. It didn’t matter what he rolled both effects were in his favor. In the end he removed all cards of his opponents Graveyard to deprive him of Fairy Tail - Snow effect. Lullaby of Obedience is not all that new, but it started to see play with the Zoodiac format. The reason being, that a lot of Decks run the similar engines. Taking an opponents Speedroid Terrortop or a Maxx "C" opens up new plays. You can either use the card to proceed your game state or hold the card and not play it to stymie your oppoent. Both are reasonable options! The cost of 2000 lifepoints is usually worth it unless the opponent was clever enough to sideboard accordingly.